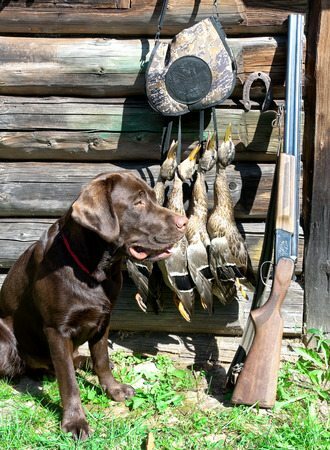 Labrador retrievers make excellent hunting companions. As their name suggest, the breed is well known for their skill with retrieving birds during hunting trips – not to mention keeping you company as you hunt. However, to make the most of their unique abilities as hunting dogs, you need to train labs properly or have them trained prior to taking them out on trips. You also must constantly reinforce what they have learned in training to keep them sharp at all times. If you do this, you will find that they will be properly prepared to hunt with you and know how to react to your every command. Before a Labrador retriever starts to learn their retrieving skills, it’s first important for them to learn obedience. As Ducks Unlimited notes, there are some people who attempt to train a Labrador retriever by first teaching it how to retrieve and then trying to teach it how to stay on command. Instead, it’s important to emphasize obedience training, teaching your lab to listen to your commands and then working on retrieval training. Once your pup is responsive and obedient, you can start training retrieval, mixing falling dummies into your training process. At times, you should have the Labrador retriever retrieve the dummy for you, and at other times, you should retrieve it yourself while you have the dog stay on command. This will teach the dog that it doesn’t need to retrieve every single thing that falls from the sky. It also will help you direct your dog on when to go and retrieve and when to stay put while you are in the field. You should also take it easy on your dog during training. While you want to prepare your lab for hunting, you don’t want to overdo it by training the dog too often. Be patient as you teach your Labrador retriever how to retrieve and it will respond accordingly. Labrador retrievers are smart dogs and tend to catch on quickly during training, as long as you work with them and give them the instruction they need. Don’t be too soft on your lab, but don’t be too aggressive. Work to strike a balance between training and fixing mistakes while still offering your dog time to relax and play, as well. At KT British Labs, we specialize in breeding smart and effective retrievers. Our dogs make great family pets and smart and effective hunting dogs as well. We have more than 30 years of experience when it comes to breeding and training Labrador retrievers, and we know we can match you up with the perfect dog and even start your pup’s training before they join your family. To learn more about our upcoming litters and started hunting dogs, give us a call today at 218-685-5103.